So is the president responsible for the accelerating recovery? No. Can we nonetheless say that we’re doing better than we would be if the other party held the White House? Yes. Do those who were blaming Mr. Obama for all our economic ills now look like knaves and fools? Yes, they do. And that’s because they are. via Presidents and the Economy – NYTimes.com. Nice summation of a basic rant re: Obama. Now that Obama has achieved all of the economic goals of the Republicans in the 2012 election one would think there would be a chastised tone coming from the folks who were so terribly wrong. However, because our media system does a fantastically horrible job of educating the populace about reality, the GOP has actually gained seats based on the results their constituents *believe* Obama has gotten, which have very little in common with the actual results. Anyway, it’s a fun dynamic to watch, although a tad bit frustrating from the rational actor viewpoint. RGHCIxc.png PNG Image, 765 × 408 pixels. 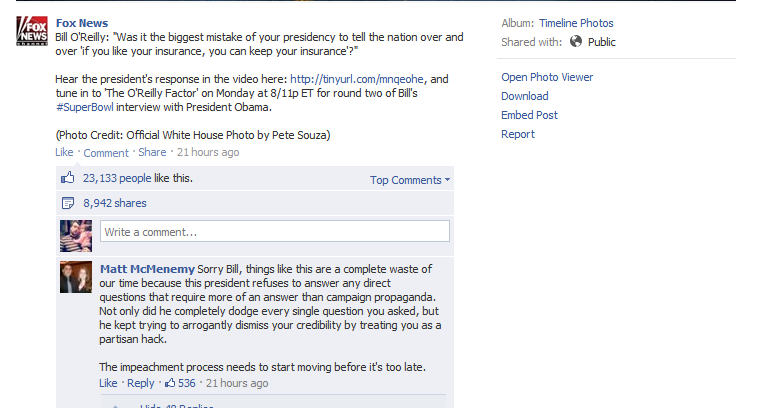 So this is the top-rated comment from the idiot brigade referring to Bill O’Reilly’s “interview” with the President. It wasn’t so much an interview as a series of accusations where. We’ve seen a pretty amazing recovery from a huge financial disaster, the end of multiple wars, and unemployment finally falling to levels not seen in half a decade. But instead of allowing any idea at all that any thing could ever be better in the slightest while *that dang Obama* is in the White House, we instead get a re-hash of the Buzzword Scandal that Fox News plays every day…IRSBENGHAZIOBAMACAREIRSBENGHAZIOBAMACARE. Ignore the fact that the website works really well now. Ignore the fact that multiple hearings into the IRS haven’t uncovered any corruption, only outdated rules. Ignore the fact that four times as many Americans were killed in West, TX, than Benghazi or that black ops happen or anything at all except somehow, someway, it’s Obama’s fault because he’s an American-hating Muslim marxist. This crap is absurd…but it’s not a fringe thing. It’s mainstream Fox viewers who believe this, because it’s all that Fox puts out. One finds more and more that watching Fox is actually an impediment to having a rational take on reality, and the top rated comment on their farce of an interview illustrates why. Here’s a solid rundown of the “interview” and how ridiculous the questions were. He was one of many Republican speakers who tried to tap into the public’s unease about the country’s future. In just days, Democrats will present a starkly different vision at their three-day convention in Charlotte, N.C., sketching out a portrait of a nation on the rebound after the worst financial crisis since the Depression. They will try to play a consistent theme in America’s history —optimism. By both showing how the change has worked, the hope stays alive. Much like in 2008, the Republicans are playing checkers, while Obama plays hyper-dimensional Chess. Barring some major event, I’ll stand by this prediction for a few more months. Note: I felt in 2004 the situation was reversed and the Democratic strategy of pointing out that Bush’s polices would *lead* to economic collapse (as they did) was weaker than the Republican’s message of “OH MY GOD!! 9/11!!!”. There is a public record of that, BTW. This is one of those things I hear a lot in various forms. Essentially this is “blaming” Obama for not fixing the Great Recession in 4 years despite having “complete” control of Congress for two full years. The reality of the history is a bit different. On July 7th, 2009, Al Franken was sworn in as a Senator for Minnesota. This was after a protracted legal battle regarding the vote count. Franken was the 60th vote that the Democrats needs to overcome the unprecedented number of “filibusters” by Republicans in the Senate. On August 26h, 2009, Ted Kennedy finally succumbed to brain cancer and unsheathed from the mortal coil. His seat was taken by Scott Brown, a Republican of sorts currently facing off against Elizabeth Warren to hold the seat. The loss of Kennedy’s vote removed the Democrats ability to overcome the Republican filibuster. The point here isn’t to focus so much of legislative minutia, but to smash a talking point. The President has faced, on the numbers alone, unprecedented opposition in trying to get *anything* done over the past 3 years and 46 weeks. For 6 weeks, the one’s noted earlier, he had the full support of Congress. Outside of that, it’s been a battle every step of the way. No really, there’s actually a number. And don’t forget to count their teachers numbers too.